The initial steps that determine development of memory in CD4 cells are unknown. To distinguish an intrinsic capacity of effectors to become memory cells from contributions of as yet undefined survival factors, we analyzed the effects of withdrawal of signals via TCR, costimulation, and cytokines from Th1 or Th2 primary effectors induced in vitro from TCR-transgenic CD4 cells. Withdrawal of stimulation caused the transition of effectors to resting populations with a memory phenotype that did not undergo division following transfer to normal syngeneic recipients. The return of effectors to rest was accompanied by acquisition of the capacity to function as memory cells in vivo as defined by extended persistence and a more rapid response to Ag in vivo than naive cells in adoptive hosts. Upon challenge with Ag, these in vitro-rested Th1 and Th2 cells were similar to long-term in vivo-rested memory cells, but distinct from in vitro-generated primary effectors and in vivo-restimulated memory effectors by their ability to resist apoptosis. Cessation of stimulation may occur when activated CD4 cells exit lymphoid tissues after priming and transition to memory may be initiated if effectors either fail to gain access to Ag in peripheral tissues where restimulation can lead to activation-induced cell death or do not receive sufficient stimuli to continue a response. Our results suggest that the first stage leading to stable CD4 memory could occur stochastically and independently of instructional processes and as such, the development of memory may be a default pathway when signals that direct responses are not received. Immunologic memory represents a fundamental attribute of the immune system characterized by the presence of a high frequency of Ag-specific cells that persist at rest for extended periods after an initial encounter with a foreign Ag and which mount a rapid recall response upon challenge with the immunizing Ag. Despite a wealth of information pertaining to functional and phenotypic characteristics of memory T cells, mechanisms that underlie the generation of memory in T lymphocytes are unknown. Ag initiates differentiation of effector cells from naive cells activated through TCR engagement which, together with costimulation, determines the degree of clonal expansion that is to a large extent regulated by IL-2-dependent cell cycle progression (1). Recent studies provide suggestive evidence that primary CD4 cells must become sufficiently activated to express IL-2 (2) and undergo division (3) to develop the capacity to become memory cells. TCR repertoire analysis further indicates that persisting memory cells derive from clones that become engaged in responses early during the course of effector development (4, 5, 6, 7). Thus, reaching a threshold of activation in the initial phases of a response when stimulation and costimulation are maximal represents a crucial turning point that determines the potential for a response to progress to memory. The extent of stimulation also affects differentiation of effectors committed to Th1 or Th2 cytokine patterns (8, 9) that can give rise to similarly polarized memory populations (10) due to epigenetic remodeling of cytokine genes (11). Thus, within effector populations are cells that become imprinted with cytokine gene expression patterns as a consequence of the initial milieu in which priming took place and have a capacity for persistence. Because of the many shared characteristics of primary and memory populations in a given response, a linear developmental pathway is likely. Moreover, as indicated above, accumulating evidence challenges a concept that memory cells preferentially develop in the later stages of the primary response when decreasing Ag stimulation would select high-affinity CD4 cells that fail to become sufficiently activated to become irreversibly committed to death. However, mechanisms that determine when in the course of a response activated CD4 cells make the transition to memory cells have yet to be identified. Although fully differentiated effectors that become restimulated by Ag undergo activation-induced cell death (AICD)3 (12, 13) and those that do not are thought to die by neglect (14), recent studies indicate that Ag is neither necessary for the CD4 effector to memory transition in vivo, nor required for the persistence of memory (15). Both active and passive mechanisms that regulate cell death have been implicated in the contraction of primary CD8 cell populations. However, we and others find that CD4 cell frequencies found at the peak of a primary response in lymphoid tissues do not diminish dramatically once a response subsides (16, 17). This suggests that survival of activated CD4 cells might instead be favored by the cessation of signaling. This concept is supported by observations that in the genetic absence of death pathways that are thought to participate in the regulation lymphocyte pool sizes, effector-like cells accumulate and cause autoimmune manifestations (reviewed in Ref. 18). We propose that coincident with termination of stimulation, activated primary CD4 cells begin to return to rest and, if further encounter with Ag does not occur in either lymphoid tissue or sites of inflammation, then revert to memory cells, in essence, by default. This hypothesis predicts that a withdrawal of signals from effector cells could be sufficient to initiate the transition to memory. To test this hypothesis, we analyzed development of memory from activated TCR-transgenic Th1 and Th2 cells. To distinguish an intrinsic capability of effector populations to become memory cells from unknown host factors that potentially contribute to differentiation or survival, we examined the characteristics and functions of Th1 and Th2 cells withdrawn from stimulation and brought to rest in vitro and then transferred to normal recipients. The data reveal that effector populations revert to cells with a resting memory phenotype, which, in vivo, exhibit characteristics typically associated with memory including persistence, rapid recall response to Ag, and resistance to AICD. The results demonstrate that by several criteria, cessation of stimulation can promote progression to a memory phenotype in CD4 cells. Our study suggests that the initial step in the generation of memory might be a passive rather than an instructional process whose onset occurs from loss of exposure to Ag and attendant inflammatory stimuli. Thereafter, homeostatic mechanisms that regulate the size of the memory CD4 cell pool would determine modulation of the frequency of persisting cells. B10.BR, (B10.BR × C57BL/6)F1, B6.PL-Thy 1a/Cy, and C57BL/6 mice and AND vα11, vβ3 TCR B10.BR (19), and (B10.BR × B6.PL-Thy 1a/Cy)F1 transgenic mice that are specific for residues 88–103 of pigeon cytochrome c were bred in the vivarium at The Scripps Research Institute (La Jolla, CA). rIL-2, rIL-4, and rIFN-γ were from X63.Ag8-653 cells transfected with murine cDNA for the respective cytokines (20). Dr. S. Wolf (Genetics Institute, Cambridge, MA) generously provided murine rIL-12. Anti-CD28 (37.51), -IL-4 (11B11), -IFN-γ (XMG1.2 and R46A2), and -CD3 (2C11) from the respective cell lines were purified using protein G. Anti-IL-2 (JES-6 1A12 and JES-6 5H4) and -IL-4 (BVD6) were obtained from BD PharMingen (San Diego, CA). mAb for flow cytometry included FITC-, PE-, APC-, and/or biotin-conjugates of anti-murine IL-2Rα (CD25, 7D4); CD44 (IM71); L-selectin (MEL-14, CD62L); LFA-1 (M17/4, CD11a); vα11 (RR8.1); vβ3 (KJ25); Thy 1.1 (OX-7, CD90.1); Thy 1.2 (53-2.1, CD90.2); and CD4 (GK1.5) from BD PharMingen. Naive CD4 cells were isolated from spleen and pooled lymph nodes (LN) (inguinal, axillary, brachial, cervical, and mesenteric) of 2- to 4-mo-old and TCR-transgenic mice. Normal memory CD4 cells were from the spleens of mice that were thymectomized at 6 wk of age and kept for 6–9 mo until depleted of naive phenotype T cells (L-selectinhigh, CD45RBhigh, CD44low) as judged by the staining of PBL. CD4 cells were isolated by magnetic separation using a mixture of mAb for CD4 enrichment from StemCell Technologies (Vancouver, British Columbia, Canada), according to the manufacturer’s instructions, and were routinely >98% CD4+. Transgenic Thy 1.1+ Th2 cells that were rested in adoptive recipients were isolated by magnetic sorting (MACS; Miltenyi Biotec, Auburn, CA) on the basis of positive selection using biotinylated anti-Thy 1.1 mAb and streptavidin-conjugated beads. In experiments involving the transfer of in vivo-generated memory cells, resting cells were separated by Percoll density gradient centrifugation (21). To generate effectors, naive CD4 cells were cultured at 2 × 106/ml in 25-ml volumes of RPMI 1640 (Irvine Scientific, Santa Ana, CA) containing 7% FCS (HyClone Laboratories, Logan, UT), 200 μg/ml penicillin, 200 U/ml streptomycin, 4 mM of l-glutamine, 10 mM of HEPES, 5 × 10−5 M of 2-ME, and 20 ng/ml rIL-2 in 75-cm2 flasks (Costar, Cambridge, MA). For stimulation, the cells were cultured in flasks that were coated with anti-CD3 at 50 μg/ml in 7.0 ml of PBS for 2 h at 37°C. These cultures were supplemented with 10 μg/ml of anti-CD28. Alternatively, stimulation was induced by the addition of 5 μM of peptide fragment containing residues 88–103 from pigeon cytochrome c (PCCF) and 2 × 106/ml splenic APC that were activated by pretreatment overnight with 5 μg/ml each dextran sulfate (Sigma-Aldrich, St. Louis, MO) and LPS (Difco, Detroit, MI) and then treated with 25 μg/ml mitomycin C (Sigma-Aldrich) at 37°C for 1 h. For Th1 cells, 5 ng/ml rIL-12 and 10 μg/ml anti-IL-4 were added. To induce Th2 cells, 10 ng/ml rIL-4 and 10 μg/ml anti-IFN-γ were added. After 48 h, the cells were fed with medium containing rIL-2. At 96 h, the cells were harvested, washed, and tested for cytokine secretion by restimulation at 5 × 105/ml in 200 μl of triplicate cultures in 96-well flat-bottom plates (Costar) either with plate-bound anti-CD3 (10 μg/ml) or with 5 μM of PCCF and an equal number of APC that were activated as described above. Supernatants were harvested 24–36 h after restimulation. Effectors that were not restimulated were injected i.v. into syngeneic recipients (5 × 106/mouse) or returned to rest by culture for 48 h at 106/ml in 75 cm2 flasks in medium without added cytokines, anti-cytokine mAb, or anti-CD3/anti-CD28. The cells were then harvested, washed, and restimulated for cytokine secretion, or were transferred to syngeneic recipients as above. CD4 cells were labeled with CFSE (Molecular Probes, Eugene, OR) as described (22). At various times after transfer to recipients, the distribution of labeled cells in suspensions of peripheral and mesenteric LN and spleen were determined by flow cytometry with vβ3-PE and vα11-biotin/streptavidin APC. CFSE staining was also used to assess cell division as measured by sequential halving of fluorescence intensity with each generation (22). To track Thy 1.1 CD4 cells in Thy 1.2 adoptive recipients, three-color analysis was used with a combination of Thy 1.1-PE and vα11-FITC, and vβ3-biotin/streptavidin APC. To assess apoptosis, in place of vα11, cells were stained with Annexin V FITC to detect membrane phosphatidylserine and, in addition with 7-amino actinomycin D, to distinguish nonviable cells. These reagents were obtained from BD PharMingen and used according to the protocol provided. For in vivo responses, (B10.BR × C57BL/6)F1 recipients of subsets of AND Thy 1.1+ transgenic CD4 cells from (AND × B6.PL-Thy 1a/Cy)F1 mice were primed with 50 μg of PCCF emulsified in CFA supplemented with 400 μg of mycobacteria H37Ra (Difco) in 0.1 ml s.c. at the base of the tail, with adjuvant alone, or were left unimmunized. Each experiment to evaluate recipients for the presence of donor cells was performed a minimum of three times and two to five mice were tested per time point. Cytokine responses of magnetically sorted donor Thy 1.1+ cells were measured after restimulation at 5 × 104 cells with 5 μM of PCCF and 2 × 105 splenic APC as described above. IL-2, IL-4, and IFN-γ were detected by ELISA (23). To assess the effects of withdrawal of TCR stimulation and growth factors on CD4 effectors independently of unknown contributions of an in vivo milieu, Th1 and Th2 cells were generated from naive CD4 cells from AND TCR-transgenic mice (19) that are specific for PCCF by stimulation with either anti-CD3 and anti-CD28 or PCCF and APC under Th1- or Th2-polarizing conditions together with rIL-2 for 4 days. The cells were then cultured without added cytokines or stimulation for 48 h and monitored for size and expression of surface markers associated with activation/priming (Fig. 1⇓). Effectors harvested from primary cultures on day 4 with either condition of stimulation contained cells that appeared activated and exhibited high but heterogeneous forward scatter (Fig. 1⇓A, activated) and were CD44high (Fig. 1⇓B, activated). Over the next 2 days, the cells became reduced in size (Fig. 1⇓A, rested), but retained CD44 (Fig. 1⇓B, rested). CD25 was highly expressed on activated effectors, but absent from rested effectors, and L-selectin was low/absent (not shown). This phenotype is typical of resting memory CD4 cells. Comparable results were obtained when anti-CD3/anti-CD28 (Fig. 1⇓, left panels) or PCCF/APC (Fig. 1⇓, right panels) were used to generate Th1 or Th2 effectors. Effectors return to rest and acquire a memory phenotype in vitro. Activated Th1 or Th2 cells were generated as described in Materials and Methods by stimulation of naive CD4 cells from AND TCR-transgenic mice with rIL-2 together with anti-CD3 and anti-CD28 or with PCCF and APC and with either rIL-12 and anti-IL-4 or rIL-4 and anti-IFN-γ, respectively. After 4 days the cells were harvested, washed, and returned to culture for 2 days without added stimuli (rested). On the day of harvest from primary cultures (activated) and 48 h later (rested), the cells were evaluated for size by forward scatter (A) and for surface CD44 expression (B) compared with an isotype control. Results are representative of six experiments. The effectors were completely viable at the time of harvest on day 4 and had expanded 3- to 5-fold from the original naive CD4 cell numbers cultured under Th1 or Th2 conditions with rIL-2. After reculture without cytokines or anti-cytokine Abs for 2 days (day 6), the viable cell recovery did not diminish significantly (Fig. 2⇓). There was no difference between Th1 and Th2 effectors generated with anti-CD3/anti-CD28 (Fig. 2⇓, top panels) or with PCCF/APC (Fig. 2⇓, bottom panels). By 24 h after withdrawal from stimulation, the cells were equivalent to resting naive cells with respect to the uptake of [3H]thymidine determined over 12-h intervals (not shown). During the transition rest, only 1% of the cells underwent an additional cycle of division as determined by CFSE staining (not shown). We did not detect secretion of IL-2, -4, -5, -10, or IFN-γ in culture supernatants, nor did we detect mRNA synthesis of cytokines that included IL-1α, -1β, -2, -3 -4, -5, -6, -10, -13, IFN-γ, TNF-α, lymphotoxin-α, or TGF-β1 by RNase protection analysis (not shown). The data demonstrate that effectors return to rest when removed from stimulation and growth factors and do not die as a consequence as do naive cells cultured for the same time period in the absence of stimulation (24). However, by 3 days, viable recovery did decline to 60–80% of the cells cultured. Recovery of rested CD4 effectors. Viable cell recovery of Th1 and Th2 AND TCR-transgenic cells is shown at 4 days after effector generation and after 2 days of culture without stimulation (day 6). Th1 and Th2 effectors were induced with either anti-CD3 and anti-CD28 or PCCF and APC from starting cultures that contained 10 × 106 naive CD4 cells. To assess whether rested effectors retained functional capacity, CD4 cells that were primed with APC/PCCF were restimulated with peptide and APC to induce cytokine secretion (Fig. 3⇓). Both subsets remained polarized with respect to cytokines (Fig. 3⇓B), although the levels were significantly lower than those produced by the Th1 and Th2 effectors from which they were derived (Fig. 3⇓A). The rested effector populations produced higher levels of IL-2 than did activated effectors as predicted by our previous studies (25). Similar results were obtained if rested Th1 or Th2 cells were generated with anti-CD3/anti-CD28. Function of rested CD4 effectors. Cytokine production of Th1 or Th2 effectors (activated) that were primed with peptide and APC (A) or of the same populations of effectors after additional culture for 2 days without stimulation (B; rested). Each of the subsets was restimulated for 24 h with PCCF and APC. Levels of IL-4 and IFN-γ in supernatants were quantitated by ELISA. To evaluate the in vivo persistence of rested effectors, Th1 and Th2 cells were generated from Thy 1.1+ AND CD4 cells from (B10.BR × B6.PL-Thy 1a/Cy)F1-transgenic mice. Half of the activated Th1 and Th2 cells were CFSE-labeled and injected into separate groups of normal (B10.BR × C57BL/6)F1 mice whose T cells express Thy 1.2. The remaining cells were rested for 2 days before CFSE labeling and adoptive transfer. At 3 days after injection, neither the activated nor rested effector populations had undergone division in LN or spleens of recipients (Fig. 4⇓, A and B). Indeed, by forward scatter, activated effector cells had returned to rest in vivo (not shown). In agreement with studies of AND CD4 cells in normal mice (26, 27), homeostatic proliferation by either naive or rested effector cells was very limited, if it occurred at all, during the first 2 wk after transfer (Fig. 3⇑C, where effector cells are rested Th1 cells). Thereafter, the intensity of CFSE staining diminishes due to cell protein turnover to an extent that it becomes more difficult to accurately measure division. Together, these results suggest that after effector generation, cell division is not required for initial survival in vivo. Th1 and Th2 subsets do not divide in vivo. 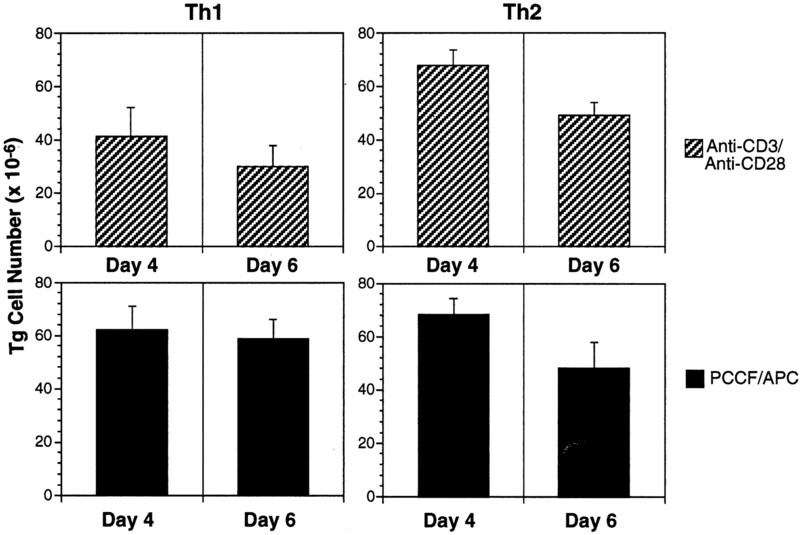 Th1 (A) or Th2 (B) AND Thy 1.1 TCR-transgenic Th1 or Th2 effectors from 4-day cultures or from cultures rested for 2 days were labeled with CFSE and 5 × 106 were transferred to Thy 1.2 (B10.BR × C57BL/6)F1 recipients. Three days later, the spleens and pooled LN were removed and CFSE staining patterns of donor cells were analyzed by flow cytometry. C, CFSE-labeled AND Thy 1.1 naive or in vitro-rested Th1 cells (5 × 106) were transferred to Thy 1.2 (B10. BR × C57BL/6)F1 recipients and splenic donor cells were analyzed for staining at 1 day and at 2 wk after transfer. We analyzed persistence of rested effector CD4 cells by determining the numbers of Thy 1.1 donor cells in recipient spleens together with pooled LN at various times over 9 wk. We compared rested transgenic Th2 cells with nontransgenic CD4 cells of a memory phenotype that were from the spleens of adult thymectomized normal mice which had become depleted of naive T cells (28). Similar decay curves were seen for the transgenic and nontransgenic populations (Fig. 5⇓A). The data reveal that activated effectors cells brought to rest in vitro behave similarly to effector populations that make the transition to rest in vivo. The results indicate that homeostasis is tightly controlled (29). Comparable data were obtained with Th1 cells (not shown). At 2–4 wk after transfer, rested Th1 and Th2 cells from recipient spleens retained the capacity for polarized cytokine secretion in response to peptide and APC (Fig. 5⇓). There was no significant difference in the capacity of rested Th1 or Th2 cells to persist or function whether anti-CD3/CD28 (Fig. 5⇓A) or PCCF/APC (Fig. 5⇓B) was used to generate effector populations. IL-2 was the only cytokine secreted by donor CD4 cells from recipients of naive AND-transgenic cells (not shown). Recovery and function of CD4 subsets after adoptive transfer. A, CD4 cells were isolated from Thy 1.1 AND TCR-transgenic mice and cultured to generate Th1 and Th2 primary effectors and rested Th1 and Th2 cells as in Fig. 1⇑. Rested cells were transferred to syngeneic (B10.BR × C57BL/6)F1 recipients. For all populations, recipients received 5 × 106 cells. A, Th2 cells were derived from naive cells that were stimulated with anti-CD3 and anti-CD28. For comparison, CD44high CD4 cells were obtained from the spleens of thymectomized mice as a source of memory cells (normal memory). Donor CD4 cells were quantitated from total cell counts and percent donor cells as determined by flow cytometry. B, Thy 1.1+ donor cells were isolated from recipient mice that received Th1 or Th2 cells primed with anti-CD3 and anti-CD28. The cells were restimulated with PCCF and splenic APC in vitro at 4 wk after transfer. C, Thy 1.1+ donor cells were isolated from recipient mice that received Th1 or Th2 cells primed with PCCF and APC. The cells were restimulated with PCCF and splenic APC at 2 wk after transfer. IL-4 and IFN-γ secretion into culture supernatants was measured after 48 h.
Because rested effectors appeared to have acquired a memory phenotype, we compared their in vivo responses to Ag with those of naive and in vivo-generated memory cells. Fig. 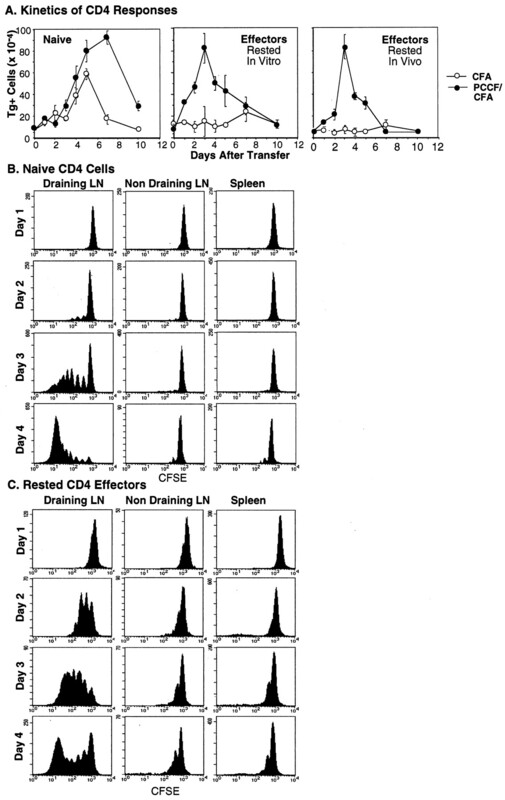 6⇓A shows the kinetics of appearance of transgenic CD4 cells in the draining LN of mice immunized with PCCF/CFA or CFA only by s.c. injection at the time of cell transfer (naive and Th2 effectors rested in vitro, left and middle panels, respectively) or 2 wk after transfer of activated Th2 cells (right panel). Consistent with previous studies (28, 30, 31), naive CD4 cells began to increase in numbers at 3 days after Ag priming and continued expansion through day 8 before declining. Naive transgenic CD4 cells also initially increased in a non-Ag-specific manner in mice treated with adjuvant alone, which we also find in contact sensitivity responses (21) and corresponds to the well-characterized LN shutdown phase when lymphocytes enter and become retained in responding LN (32). However, the nonspecific response declined more quickly than that to specific Ag and we found that naive cells did not undergo cell division in response to CFA as measured by CFSE staining (not shown), confirming that a brief period of accumulation had occurred. 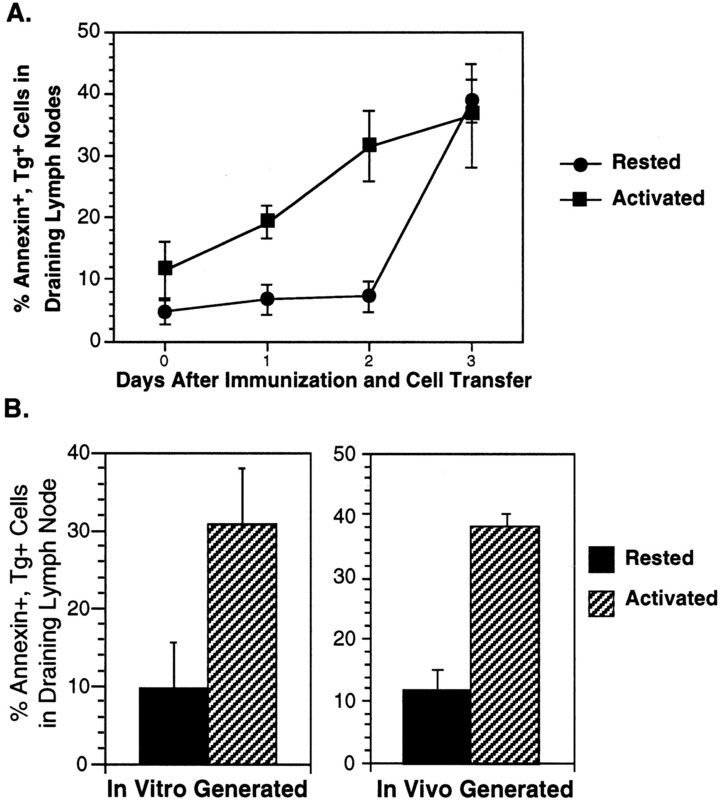 The memory CD4 response was marked by a much more rapid increase in the numbers of Ag-specific cells that peaked by 3–4 days after immunization. The kinetics of the responses of in vitro and in vivo-rested Th2 CD4 cells were similar (Fig. 6⇓A,middle and right panels, respectively). Unlike the naive CD4 response, few transgenic cells were observed in the draining LN of adjuvant-treated mice. More rapid response of rested effectors compared with naive CD4 cells to Ag in vivo. A, Recipients of freshly isolated naive TCR-transgenic CD4 cells or Th2 cells that were primed with anti-CD3 and anti-CD28 and then rested in vitro for 2 days (middle) were immunized s.c. on the day of transfer of 5 × 106 cells with either CFA or PCCF/CFA. Recipients of activated Th2 cells (right) were immunized at 2 wk after cell transfer to allow a return to rest in vivo before priming. The kinetics of Thy 1.1 donor cell accumulation in draining LN (inguinal and periaortic) in groups of three mice per time point were determined from the fraction of donor cells and the total cell counts. B, Division of naive donor cells in draining LN (inguinal, periaortic), nondraining LN (cervical, axillary, brachial), and spleen or (C) of 2 day in vitro-rested Th2 cells in the same sites by CFSE staining. Since an increase in Ag-specific cells represents a combination of expansion together with recruitment, we determined whether the rate of proliferation of naive vs memory cells might contribute to the overall level of response. Naive cells (Fig. 6⇑B) did not undergo division until day 3 after priming, and by day 4, most of the cells that were detected in the draining LN had undergone at least seven divisions. Dividing cells were not observed in either the nondraining LN or the spleen. Further, no division by naive CD4 cells was seen in any tissue of mice given CFA only (not shown). Fig. 6⇑C depicts the kinetics of division of rested Th2 cells in response to Ag. Clearly, cell division of the rested population was underway by day 2. We have previously shown that few memory CD4 cells localize in LN in the absence of specific Ag and have demonstrated that recruitment occurs in response to specific stimulation (21). In this study, memory cells that have yet to divide become visible by day 4 as suggested by the appearance of a peak of undivided cells. This population may represent newly recruited cells and/or a subset that has yet to become engaged in the response by division and remains in LN as activated cells proliferate, egress, or undergo AICD. Like naive cells, dividing memory cells were only found in draining LN, and no division occurred when CFA alone was injected (not shown). Thus, effector cells that make a transition to rest in vitro have the capacity to become engaged in an in vivo response earlier than do naive cells. In vitro studies suggest that, compared with memory cells, effectors have an increased propensity to undergo AICD in response to re-encounter with Ag (12, 13), an important aspect of regulation of effector responses. Using the localization of cells in LN as a model to analyze the effects of Ag restimulation, we compared the extent of apoptosis that occurred in memory and effector populations. 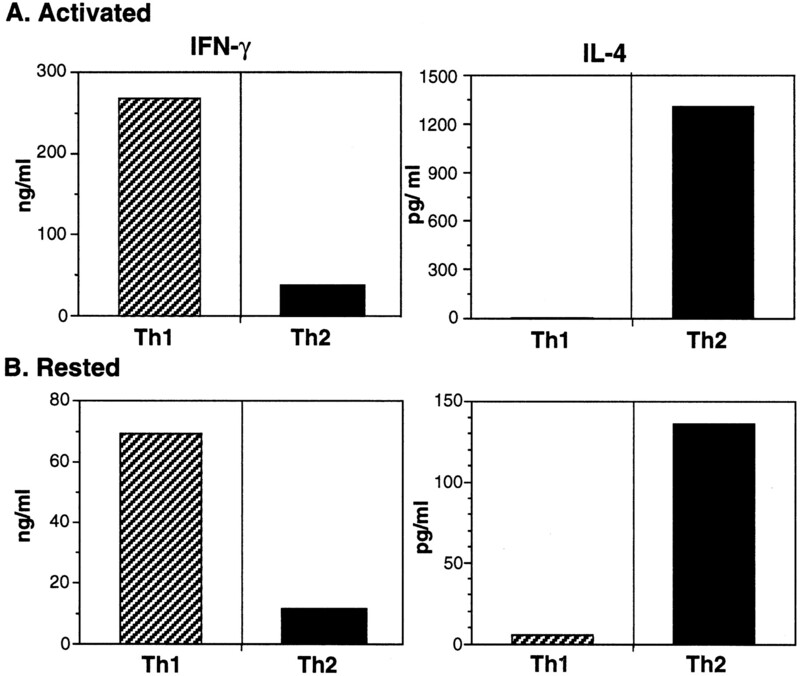 Groups of mice were injected with equal numbers of activated Th1 or Th2 cells or rested Th1 or Th2 cells. At the time of transfer, mice were given CFA, PCCF/CFA, or left untreated. In Fig. 7⇓A, the kinetics of appearance of annexin V+ transgenic Th1 donor cells in draining LN were analyzed by flow cytometry. Dead cells, which were few, were gated out using the DNA binding dye, 7-amino actinomycin D. The percentage of apoptotic donor cells was consistently higher in recipients of activated Th1 cells than in recipients of the rested Th1 cells during the first 2 days after adoptive transfer. By day 3, this difference was no longer apparent. Reduced numbers of annexin V+ cells were also found in recipients of rested compared with activated Th2 cells (Fig. 7⇓B) and again this distinction was typically no longer apparent by day 3. There were no differences in the fraction of apoptotic donor cells in the recipient spleens (not shown). Susceptibility to apoptosis distinguishes the responses of activated and rested effectors to Ag in vivo. Four-day-activated Th1 or Th2 effectors or 2-day-rested Th1 and Th2 cells (memory) that were generated from Thy 1.1 AND TCR-transgenic mice by stimulation with anti-CD3 and anti-CD28 were transferred to normal (B10.BR × C57BL/6)F1 recipients that were immunized on the day of cell transfer with PCCF and adjuvant. Apoptosis of donor cells in draining LN was evaluated by annexin V staining. A, The kinetics of appearance of apoptotic cells in recipients of activated as compared with rested Th1 cells. Two to five mice were evaluated per time point. B, Comparison of in vitro- (left panel) and in vivo-generated (right panel) effector populations for susceptibility to apoptosis in vivo. Apoptosis of in vitro-activated and rested Th2 cells was evaluated at 2 days after cell transfer and immunization of recipients. To assess apoptosis of CD4 cells that were restimulated in vivo, 4-day-activated Th2 cells were transferred to normal recipients. Three months later, to generate memory effectors, one group of recipients was immunized with peptide Ag in CFA. Five days later, this group of mice was boosted with Ag by the same route to generate memory effectors. On the same day, a second group of animals was given a first immunization to restimulate resting memory cells. Two days after the last injection of Ag, apoptosis of donor cells was measured by using annexin V. Groups of three mice were evaluated for each subset of in vitro- and in vivo-activated populations. Data are representative of results from four experiments. Although in vitro- and in vivo-activated T cells have been shown to home with comparable efficiency to sites of inflammation and to distribute similarly to memory cells in both lymphoid and nonlymphoid organs (Ref. 33 and L. M. Bradley, unpublished observations), we wished to exclude the possibility that a propensity to undergo AICD was not simply due to altered trafficking of cultured cells or to the strong in vitro conditions of TCR stimulation and costimulation that might not be reproduced in an in vivo response to Ag. To this end, we transferred Th2 effector cells to normal recipients that were then left unmanipulated for 3 mo. To generate memory effectors in vivo, one group of these recipients was immunized with peptide Ag in CFA and then boosted with Ag by the same route. Another group of animals was given a first immunization to induce the initial recall response of resting memory cells. Injections were timed so that two days after the last injection of Ag, we could determine the fraction of annexin V+ cells in the boosted and unboosted groups. The results shown in Fig. 7⇑B demonstrate that a greater fraction of in vivo-generated memory effectors initiate apoptosis in response to restimulation than do resting memory cells. Ag initiates T cell clonal expansion and differentiation of effector populations (16, 17, 34, 35, 36, 37) while its clearance from the system typically signals the termination of a primary response, revealing the existence of a state of memory where a high frequency of resting Ag-specific cells persists (38, 39). What causes the transition of a responding T cell to a memory cell in the course of an immune response represents a fundamental unanswered question in our understanding of the development of immunity. To discern factors that control the generation of memory, we considered the primary immune response from a topographical view wherein the most apparent and dynamic aspect of an in vivo response that could have a profound effect on the responses and survival of primed CD4 effectors cells is migratory behavior. Effector cells that leave the environment of secondary lymphoid tissue where an Ag-specific response is underway are abruptly withdrawn from a milieu that supports their differentiation and expansion. Although some cells that enter the circulation relocate to peripheral sites of Ag deposition where their response to restimulation is thought to be followed by AICD, a population of cells with a corresponding TCR repertoire does persist. Such cells could be among those that fail to gain access to inflammatory sites because it is well established that only a fraction of T cells interact with activated vascular endothelium under the shear forces present in blood vessels (40), and of those that do, many do not complete the process of transmigration (41). This scenario predicts that many effectors may not have the opportunity to enter peripheral sites of Ag exposure. Because TCR stimulation in combination with costimulation promotes survival of T cells by induction of anti-apoptotic genes such as Bcl-2 and Bcl-xL (1, 42, 43), our results suggest that such cells have the potential to escape death due to the loss of active signaling processes. As effectors continue to circulate they would revert to rest if Ag is not then re-encountered in lymphoid tissues. Our data show that Th1 and Th2 effectors that are brought to rest in vitro due to cessation of stimulation acquire phenotypic and functional characteristics that are associated with memory cells. The results suggest that in the absence of instructions to further participate in the response, responding effector cells may have the opportunity to become memory cells. Thus, we propose that withdrawal of stimulation does not lead to immediate death of effectors and instead might endow them with a potential for life. A similar hypothesis that T cells generated in the primary response are programmed to live rather than die has recently been proposed by Sprent and Surh (18) on the basis of findings that gene knockout mice lacking molecules implicated in cell death pathways exhibit lymphoproliferative and autoimmune manifestations. This conclusion is further supported by a recent study with a model similar to the one used here (44). In our study, use of an in vitro model where signaling via TCR, costimulatory molecules, and cytokines could be removed from Th1 and Th2 cells allowed for the distinction of the effects of withdrawal of stimulation from potential contribution(s) of additional in vivo signals that might affect CD4 cell differentiation or survival. The results show that both CD4 subsets behave similarly to cease division, down-regulate IL-2Rα, and become small in size within 2 days in the absence of external stimuli without undergoing apoptosis as do naive cells (24). By these criteria as well as adhesion molecule expression, in vivo persistence and response, and resistance to AICD, the sudden termination of effector cell responses resulted in the rapid appearance of CD4 populations that were indistinguishable from resting memory cells. These results counter a view that without stimulation most CD4 effectors die. The data are reminiscent of studies on the consequences of growth factor withdrawal on cell metabolism and survival in vitro (45, 46). Such studies show that Bcl-xL confers resistance of nontransformed T and pro-B cell lines to death upon withdrawal of cytokine-mediated growth support. The cells become small in size and initially survive by reduced metabolic activity and then catabolic processes until starvation ensues after several days or the cells are rescued by further supplements. Since Bcl-xL has a key role in CD4 cell survival after activation (1, 43), we envision that expression of survival genes may allow a similar process to occur in the development of CD4 memory with an initial step that is independent of overt signals. Ultimately, survival signals would become critical. Although Ag does not play a role in memory T cell survival (15, 47), cytokines, and IL-15 in particular, sustain CD8 memory cells (18, 29). However, factors that perform a similar function for memory CD4 cells have not been identified. We did not detect synthesis of a large panel of cytokines that included IL-1α, -1β, -2, -3 -4, -5, -6, -10, -13, IFN-γ, TNF-α, lymphotoxin-α, or TGF-β1 which suggests that the cells undergoing a transition to rest are unlikely to actively secrete survival factors themselves. Our results also support the report that the development of memory from effectors may not require cell division (44) and suggest the possibility that no further differentiation is required. Our data, together with that recently reported (44), are most consistent with linear development of memory cells from effectors, as shown for CD8 memory (48), with a passive transition from a state of activation to one of rest. We hypothesize that availability of Ag and associated inflammatory stimuli are key to determining the timing of the onset of memory development at the level of individual CD4 cells. Studies showing that activated Th1 and Th2 cells give rise to memory cells in vivo in the absence of Ag support a view that TCR signaling, while required for priming, is not necessary for differentiation of memory cells (15). Furthermore, several studies indicate that the TCR repertoire of memory T cells is determined early in the primary response (4, 5, 6, 7). Thus, conditions that underlie the development of CD4 cells with the capacity to become memory cells exist concurrently with those that support the differentiation of effector populations rather than solely at the later phase of a declining response when Ag concentrations have diminished. Although our results suggest that effector cells can survive in the absence of overt signals for at least 2 days, it is likely that in vivo, cells would receive survival signals within a shorter time period, resulting in a temporal overlap in processes that lead to memory generation and persistence. By the criteria we used to compare responses of rested effectors with naive and activated CD4 subsets, it is clear that even after a relatively brief period in the absence of stimulation, responding CD4 cells return to rest and become indistinguishable from memory cells. As predicted for the memory response (49, 50, 51), the kinetics of expansion of rested effectors to Ag were more rapid than for naive cells and responses of in vitro- and in vivo-rested effectors were comparable and localized to the draining LN. In vitro primed and rested CD4 cells that persist after transfer exhibited similar decay to in vivo-generated memory phenotype cells and effectors that were brought to rest in vivo (data not shown) suggesting that in vitro-primed populations respond normally to homeostatic regulation without intrinsic differences in capability for survival. Thus, rested effectors do not appear to represent a transitional state. In support of this conclusion, our results show that following transfer, no bystander proliferation in response to the adjuvant CFA is observed. Because rested Th1 and Th2 cells in this study exclusively bore a memory phenotype, it is probable that the entire naive population became engaged in the response under the conditions of stimulation. However, as would be expected in a typical immune reaction, before withdrawal of stimulation, effector populations were heterogeneous in terms of size, suggesting an asynchronous response. In our model, comparable levels of stimulation were achieved with anti-CD3/anti-CD28 and peptide/APC. However, previous studies have documented that even under similar, apparently optimal, conditions of stimulation of CD4 cells, although all cells can become activated as indicated by surface marker expression, only a fraction of the cells undergo division (3, 52). Therefore, it remains possible that only a cohort of cells that achieved a particular threshold of response in our effector cultures could become true memory cells in vivo (2, 53). However, in recent experiments, we find that by prolonging effector cultures for 2 days, a population of CD4 cells that is >90% activated by size and has undergone more than seven divisions is generated. When returned to rest, these cells are indistinguishable from those analyzed in this study in detail (J. Harbertson and L. M. Bradley, unpublished data). Thus, at the minimum, CD4 cells within populations that become sufficiently activated to enter cell cycle and continue to proliferate are capable of becoming memory cells. It is well established that effector cells, unlike naive or memory cells, are highly susceptible to AICD in vitro (12, 54) which predicts that memory and effector populations might be distinguished on the basis of their response to Ag-stimulation in vivo by this criteria. Following restimulation by Ag in vivo, both Th1 and Th2 effector populations contained cells at early stages of apoptosis in draining LN, but their return to rest in vitro before exposure to Ag in vivo was associated with greater resistance to AICD. Effectors that were primed in vivo also showed greater susceptibility to apoptotic death than did in vivo-restimulated rested memory cells, when both populations were derived from rested Th2 cells that were parked in normal recipients for > 3 mo. These data are compatible with the view that effectors are programmed to mediate functions such as cytokine secretion in response to TCR stimulation and then undergo AICD. Nonetheless, even in peripheral tissues, it is clear that death is not the fate for all effectors. Two recent studies indicate that CD4 memory cells can persist outside lymphoid tissue in the apparent absence of overt stimulation (55, 56). Presumably, as inflammation subsides, chemokine directed movement through tissue may be unsustainable, limiting access of individual cells to signaling. But again, we would predict that loss of signaling would be a key determinant to the timing of the onset of memory development and that persisting cells have a capacity to respond to survival signals present within a particular site. The results of this study are most compatible with a stochastic view of memory development during the primary CD4 response in vivo where effector and memory CD4 generation temporally overlap. That loss of signals could initiate a linear transition of activated CD4 cells to memory is consistent with coordinate generation of effector and memory populations. Our data are compatible with the hypothesis that the initial step in the effector to memory transition need not require cell division and/or depend on a contribution of cytokines or other external survival signals. However, once a state of memory has been achieved, the size and persistence of the memory CD4 cell pool would be subject to regulation by as yet undefined homeostatic mechanisms. We thank Valerie Asensio for performing RNase protection assays. ↵1 This work was supported by National Institutes of Health Grants AI32978 and AI46530. This is manuscript number 13266-IMM from The Scripps Research Institute. ↵3 Abbreviations used in this paper: AICD, activation-induced cell death; LN, lymph node; PCCF, peptide fragment containing residues 88–103 from pigeon cytochrome c.